In Ireland the Penal Laws were a series of laws imposed by Britain to force the Catholic population to accept the reformed Christian faith, the Protestant Church of Ireland. This resulted in the suppression of Catholic Church practices including the celebration of Mass. Priests became fugitives but continued to minister to their flock. It was a complicated situation as many Catholic aristocratic families in Ireland and the rest of the Britain supported the monarchy and had done so from before the English Civil War, when the monarchy was abolished. The monarchy was later reinstated and although Protestant, was still supported by the Catholic aristocracy. Many great houses of the time, in Ireland and England, had elaborate hiding places for visiting priests. In poorer areas priests hid in inaccessible mountainous or wooded areas. Local legend has it that this island, in the centre of Kilberry Bog, Derryvullagh Island, was one such hiding place. A secret path through the treacherous bogland was known to the locals and it was here a priest would be safe. Most of the Penal Laws were repealed by the late 18th century, the last in 1920 with the ‘Government of Ireland Act’. A few places remain where one can imagine the bogland as it was then, before drainage and the harvesting of peat. In this painting I was trying to convey a safe refuge in a dangerous place. The base layer is Alkyd fast drying oil colour. After an hour I switched to traditional oil colours. Recent posts explained my reasoning for this change of paint type. There was a stage when both Alkyd and standard oils were used together. In these mixes I made sure the two paint types were well blended together in case I got a layer of quick drying paint lying on top of a slow drying layer. The manufacturers of Alkyd paint (Windsor & Newton) stress the importance of this as a quick drying layer would seal off the supply of oxygen and retard the drying of the under layer. Way back in September I was using a ‘watercolour’ technique (using White Spirits instead of water, see here) to try and produce transparent shadow areas in an oil painting. I discovered that the oil colours did not have sufficient transparency for the technique to be successful. Alkyd colours are much more transparent than their equivalent oils. This is stated in the description of the colours and at the time I did not pay much attention to this as certain oil colours are also regarded as transparent. Alkyds are noticeably more transparent. You can see this in the video below. So I will be returning to explore further the use of ‘washes’ of darker colour to build up the shadow areas. This time, however, I will be using Alkyd colours. On the subject of watercolour techniques, there is another use of Alkyd colour which is similar to this medium. Its where darker colours are placed on top of lighter washes previously applied. In alla prima, this is not possible as placing a darker colour on a wet lighter colour usually makes a mess. Washes of Alkyd colour in White Spirits dries almost at once. So, unusually, its possible to move from light to dark colours and then back to putting dark on the light colours, in a single painting session. This is a powerful advantage to an alla prima painter. 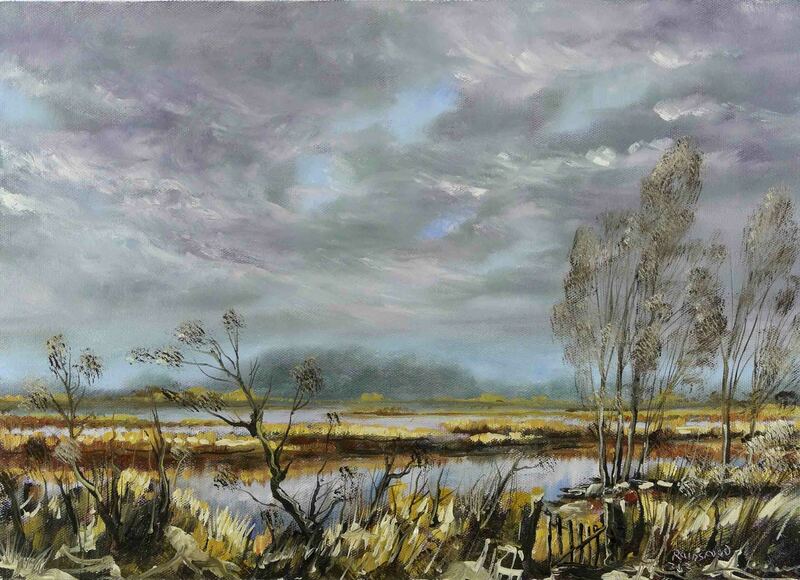 An example of this is in painting dark clouds onto a light blue sky containing white in the blue mix. All in all, my experience so far using this medium is positive. Many of the limitations I was experiencing with standard oils alone are no longer an issue. For me, it makes painting an oil painting alla prima, wet on wet, single session or whatever, a lot easier. There are signs of spring everywhere. The dead dry vegetation of last summer is infiltrated with this year’s new shoots, a haze of green. 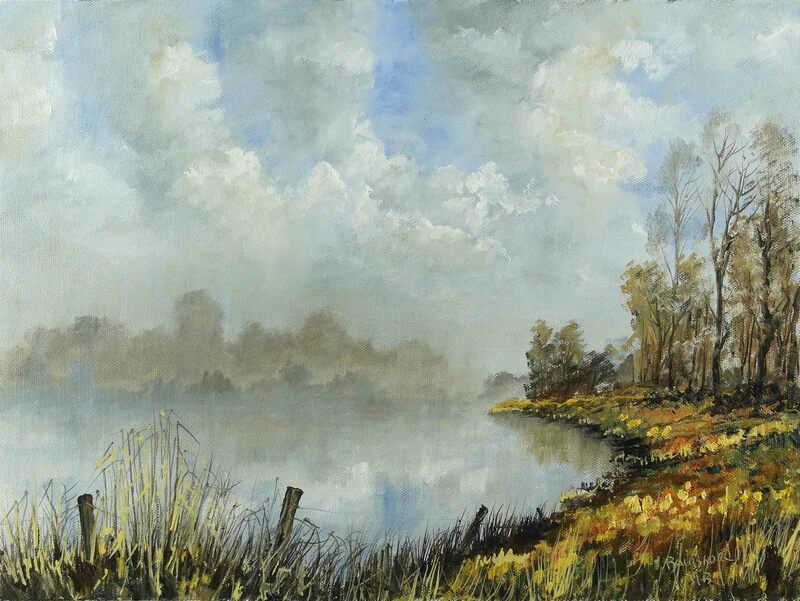 This is another ‘hybrid’ painting – a mix of Alkyd and traditional oils. Here I wanted to try ‘scumbling’. This is where fresh paint is dragged across the surface of an already dry layer, normally painted at least a few days previously. With Alkyd as the under layer, I can do this effect in a single painting session. You can see this in the sky and water. Lighter shades of colour are placed on top of the darker washes of Alkyd, without he two colours blending together into a single paint layer. This is vibrant and in the large expanse of sky and water, the added texture allows this large featureless area to work with the very solid structure of the lake shore on the right. Alkyds have expanded the capabilities of oil paint for me. At the moment I’m pushing this extra freedom especially into areas previously unavailable to me as an alla prima painter. The medium is dictating the type and therefore the subject matter of the paintings I’m attempting at the moment. Just a quick post in honour of the patron saint. A Saint Patrick’s Day painting, to be sure. Green, green and more green. This is a beautiful walk along the banks of the Slaney River on the grounds of Altamont Gardens. I’m playing around with the Alkyd oil paints. Doing all the things I couldn’t do with traditional oils. I will post the video of the painting process in a few days with a bit more on the how I’m adjusting to the fast drying oils. 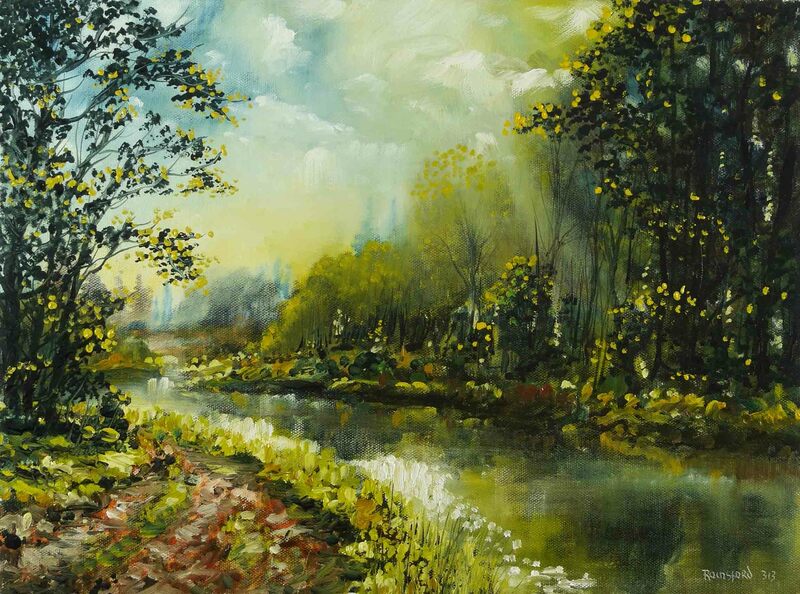 There are limitations in every medium and quite a few in the art of oil painting. Traditional working methods are best served by painting in stages, allowing each to dry before the next stage is begun. This process does not suit my current painting method, which is ‘alla prima’. By choosing this road to follow I accept the limitations – wet underpainting, no glazing or scumbling, and possibly the most limiting, the inability to ‘backtrack’. This means the final colours, mostly containing white, are almost impossible to alter once put in place, except by scraping off. Its to do with the slow drying of oil paint which favours slow working. One of my ‘workarounds’ is not to add any medium, just solvent to the paint mixes. Another is to use Liquin as the medium. This is an Alkyd medium and is principally used to speed-up the final drying time of paintings and this it does admirably. However my use of this medium was because it made under layers ‘tacky’ while the painting was in progress. An advantage over wet oily layers but not ideal. I suppose its a natural progression to go further into the Alkyd based oil colours and this is what I’m experimenting with at the moment. My first surprise in using these colours is the speed at which they dry. In this painting, the initial blue, applied with solvent only to the sky, was dry enough not to mix with the subsequent applications of paint – 10 minutes later. I didn’t expect this and actually wanted a certain amount of mixing to happen. Next time I’ll use less solvent or maybe add a little Liquin instead of solvent. Another surprise was with the distant hills on the horizon, they were scumbled over with the light grey of the sky. Impossible to do with traditional oil paint. 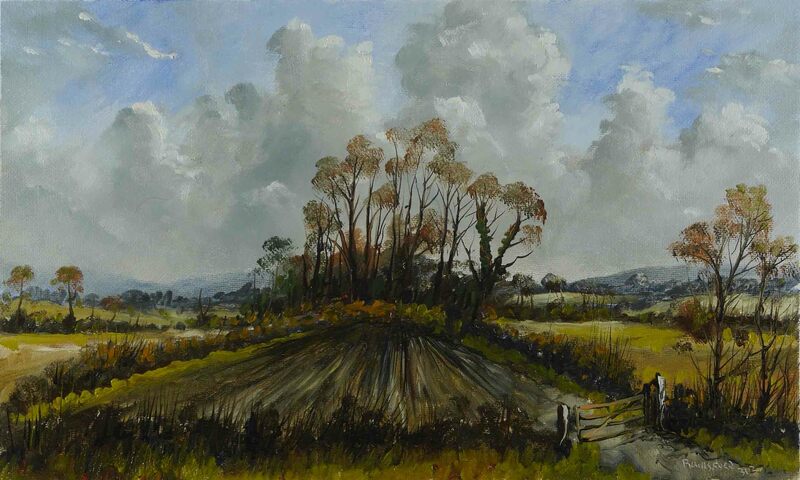 The light colours of the ploughed field were dry enough to be glazed over with a transparent layer of Raw Umber. At this point in the experiment I’m pleased with the Alkyd paints and will continue to see how far I can push the method. A word of caution. Be careful of you brushes if you try this medium. If you use a large number of brushes and leave some of them standing for long periods (a few hours) between usage, the paint will have started to dry. I would normally use very few, adjusting the colour on the palette to allow for the paint already on the brush. This is not a normal practice but suits the Alkyd method of working. It would seem that much of what I was doing with traditional oils was more suited to the Alkyd method. I have just completed another painting doing all the things I was not able to do previously and will post it soon. In the meantime have a look at this video of the above painting. See you soon. I intended to use Alkyd only colour, plus traditional Titanium White and Ivory Black oils. As it turned out I under painted in Alkyd, Yellow Ochre, Burnt Sienna, Raw Umber and Prussian Blue, then finished in standard Cadmium Yellow, Viridian Green and Cobalt Blue. So here are my initial observations. Everything happens fast. Thin washes, with solvent only, are sufficiently ‘set’ after evaporation, not to mix with subsequent layers of paint. This is similar to how traditional oils behave after 24 hours. Thicker layers stay workable for at least a few hours. This is good for my method as I very often paint an under layer, sometimes to mix with later layers and other times I’d prefer if they didn’t mix. This is controllable by the addition of solvent or the thickness of the under layer applied. As an under paint, Alkyds are good. Strong transparent rich colour, drying fast to an inflexible layer allowing later additions of traditional oils. However, in this first encounter with Alkyd paint, I could not get the paint to produce an intense final layer. I rescued the painting with standard oil colour. The Alkyd paints I used, Yellow Ochre, Burnt Sienna, Raw Umber and Prussian Blue would have been capable of producing a final layer in standard oils, but not so here. I think if I were to use Alkyd only I would have to increase the number of tube colours on the palette to compensate for this. I will post the video of the painting process in a few days.